At Atlanta Wellness Studio we enjoy being a vital part of the Atlanta community. We can be seen volunteering and working with local businesses and non-profits to help out when we can. 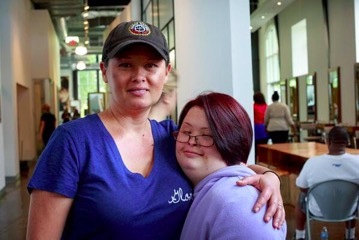 An amazing woman named Gloria Owczarski, a Special Olympics Swim Coach, started an event she coined “Day of Beauty” for kids with special needs such as Down Syndrome, Cerebral Palsy, Autism, etc. She partnered with The Paul Mitchell School of Atlanta to put on this awesome event. It is so rewarding to see how much community support she has been able to achieve and it has been a great success! This event has been featured on CBS and in Best Self Magazine. For over 10 years now, she brings in schools of children with disabilities along with their hard working teachers and offers them a total day of much needed pampering and love. The kids get to choose from the following FREE services, donated by many wonderfully talented and kind hearted service technicians from ALL OVER Atlanta: haircuts, hair color, facial waxing, manicures, makeup applications and chair massages. For most kids, this is their first experience in a “real” Salon. VITAS Healthcare serves people with serious illnesses. Their hospice care and palliative services provide comfort to patients and preserve dignity in the face of terminal illness. When medical treatments can no longer cure a disease, their interdisciplinary team of hospice care professionals still can do a great deal to control pain, reduce anxiety and offer needed spiritual and emotional support to patients and their families. They introduce gradual, non-crisis transitions from curative care to hospice care. There is time to talk, to try treatments and therapies, and to ensure comfort and dignity. VITAS hospice care services are for adult and pediatric patients with a wide range of life-limiting illnesses, including cancer, stroke, heart disease, lung disease, liver disease, kidney disease, multiple sclerosis, ALS, Alzheimer’s and AIDS. VITAS Healthcare operates hospice programs in 16 states and is one of the nation’s largest providers of end-of-life care. The name VITAS is derived from the Latin word for life. It symbolizes their mission: to preserve the quality of life for those who have a limited time to live. Massage Therapy and Reiki Volunteers comfort VITAS patients at the end of life—and their families—with relaxing and pain-reducing therapeutic touch and massage. A dying patient’s sense of isolation from the world around him or her is often made worse by the lack of comforting human touch. Muscles may be contracted and stiff, and all that is needed is for someone to gently rub the shoulders, neck and back. When patients spend their days immobile in a recliner or bed, Massage Therapy and Reiki Volunteers provide compassionate touch, relaxation, a sense of well being, emotional health and a state of balance. Volunteering professional services to a VITAS patient makes you feel as good and grateful as the patient feels!